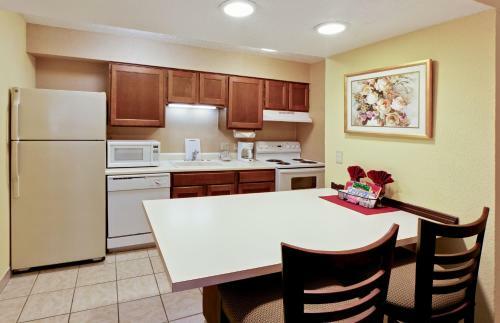 This suite includes a stovetop oven, microwave, refrigerator, toaster and dishwasher. Featuring a bathroom with a bath, shower and full size wall mirror, this penthouse suite also includes two 32-inch TVs and a separate living room. 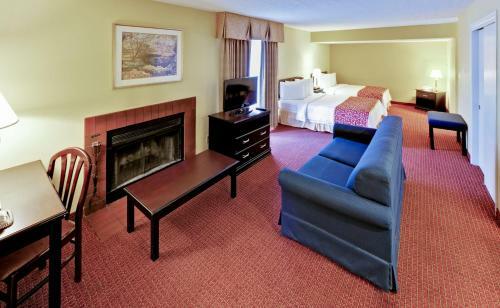 This suite offers handicap-accessible amenities, including a roll-in shower and safety grab bars. 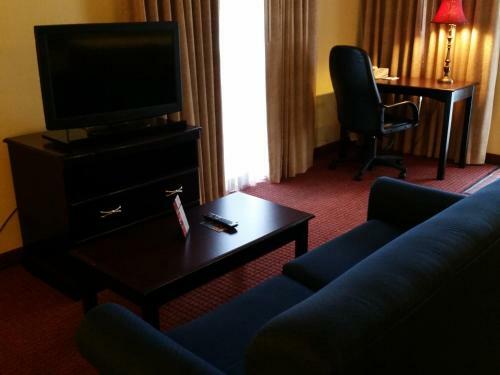 Just 8 miles away from Ohio State University, this all-suites hotel is located in Columbus and offers complimentary daily hot breakfast and free WiFi. Every suite at Hawthorn Suites By Wyndham Columbus North includes a fully-equipped kitchen with a dining area and a sofa bed. A coffee machine is also offered. 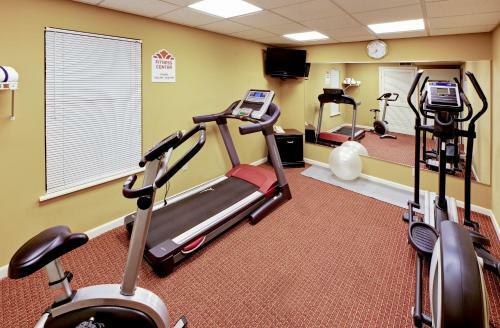 Guests can enjoy a swim in the heated outdoor pool or work out at the on-site fitness centre. 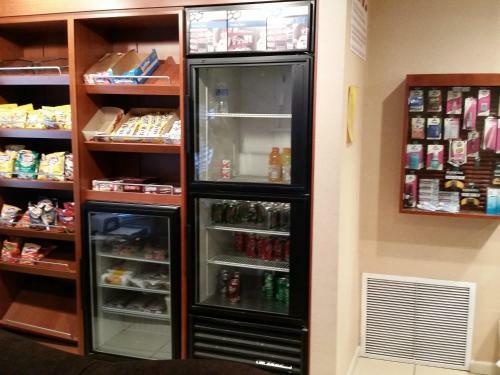 A convenience store, gift shop and laundry facilities are also available at the hotel. The property offers free parking. Magic Mountain Fun Center is 4 miles away and offers miniature golf, go-karts and arcade games. 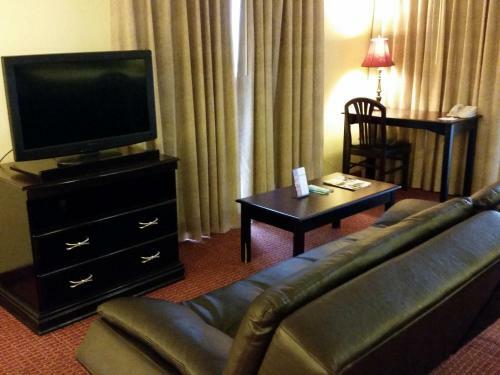 The Columbus Zoo and Aquarium is a 20-minute drive away from the hotel. You must show a valid ID and credit card upon check in. The property does not accept cash as a form of payment. Please note that all special requests cannot be guaranteed and are subject to availability upon check in. Additional charges may apply. Guest under 21 years old can only check in with a parent or official guardian. Please note an additional deposit of USD 100 is charged to guests making local reservations. Guests are required to show a photo identification and credit card upon check-in. Please note that all Special Requests are subject to availability and additional charges may apply. Not a bad deal - depends on the weekend. Suite was nice. The location is good, the Suite was nice - needs updated a bit, but I believe they are in the process. Staff was super friendly and even made sure we were roomed next to our friends. Breakfast was horrible. Everything appeared to just be warmed up freezer food. Beds could have been softer, but I have definitely slept on worse. Great to stay in a new hotel! Traffic getting into the hotel in front due to road construction. The amenities were decades old, as was the bed, and bathroom. The parking lot had zero lighting. A lot of space. Comfy bed. Great vanity area. Hard wood floors everywhere. The floor wasn't dirty, but our feet were black when we would walk on the floor. The bed was really comfortable. The sheets were soft and smooth. Having a full kitchen was nice Location was central to where we needed to be. Fireplace and full breakfast were bonuses. Maintenance came when called to replace florescent light when it went out. Room was very dated. Carpet was disgustingly filthy which made the bottoms of my feet black. WiFi was really spotty, mostly unavailable. 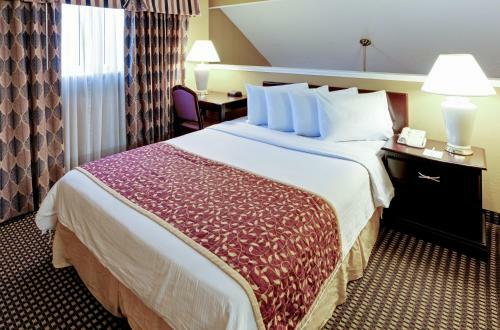 Spacious rooms, bacon for breakfast ! A two star property currently, with staff doing its best to make it better. The staff, especially Tamara, was outstanding and went out of her way to accommodate. Mattress was so-so, but I understand renovations are taking place. The property is showing its age and it is time for an update. I was not prepared for the $100 deposit. 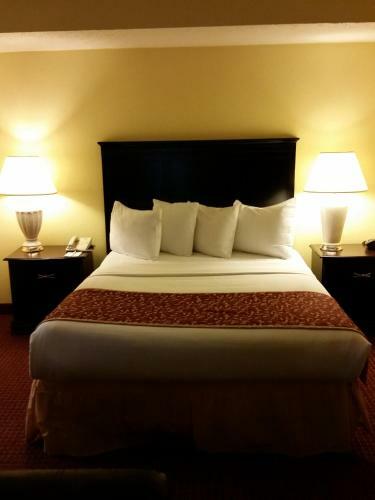 Very nice room for the money, I would dfinetly stay there again but I would bring my own swifter. Very nice room and lay out. The cleanliness leaved a bit to be desired. The floor of entire suite was dirty. After getting out of the shower and walking to kitchen area our feet were dirty though it did not appear to be. The room was beautiful...the bed was amazing...the pillows were a little bit to soft for my liking but im picky.My wife and son loved it...my son loved the breakfast and wife liked it also. 1 hour late check out DECLINED! Ask for 1 hour late check out. Declined. Couldn't even get 15 minutes. Someone was at our door at check out time SHARP to clean room. Really? I have never been declined an hour later check out. And it was requested way in advance when I booked the room. Place needs help... Updating, remodel etc. Nothing. I left early, place was sub par. This place needs some serious updating. We arrived at night so we couldn't see the entire property, however in the light of day.. Not good. The entire property needs a good coat of paint, and the kitchenettes / baths need work as well. Visible patch work in bath & kitchen, not done very well at all. The place seemed very sketchy and I left early because my teenage daughter & I felt very uncomfortable. Will not ever stay at a Hawthorne again. Horrible experience ! Nasty. Hair in the sink, hair in the bed when turned down, blood in the floor. This was the NASTIEST place I have ever seen. Hair in the sink, hair in the bed when turned down. Blood on the floor on the side of the bed. Voiced complaint. HORRIBLE EXPERIENCE. AVOID THIS PROPERTY ! The staff (front office ) needs to more professional.The whole experience wasn't pleasant!!!!!! My booking was for 8 rooms, each one of the guest in each room had major complaints!!!! Worse experience our group has had !!!!!! The company of my friend. I liked nothing about the hotel. The staff has the worst customer service I have ever encountered. I talked to them again after my stay to discuss a 100 deposit I have had placed on my card. I had to put a deposit down because of where a live....which is a much nicer area than the hotel. It is advertised as the Easton area, but is located by the continent on 161. When I questioned the deposit I was told it wasn't his responsibility to explain there policies to me! 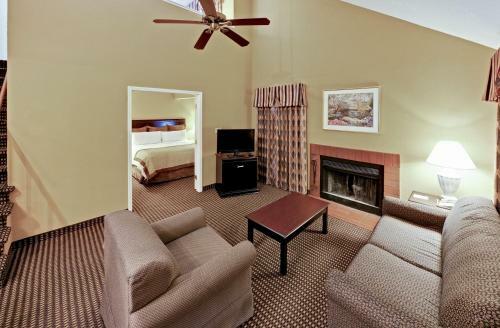 This simple, extended-stay hotel, set just off I-71, lies 8 miles from Ohio Stadium, and 14 miles from Columbus Zoo and Aquarium. 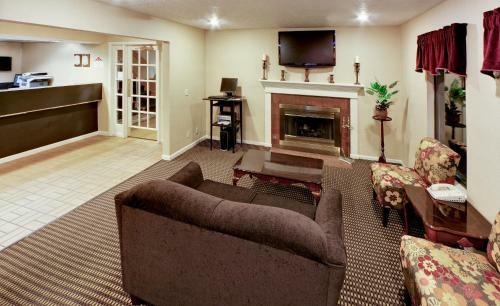 The casual suites come with complimentary Wi-Fi, flat-screen TVs and full kitchens. They also include pull-out sofas, workspaces and fireplaces. Children age 17 and under stay free with an adult. Free perks include hot breakfast buffet and parking. 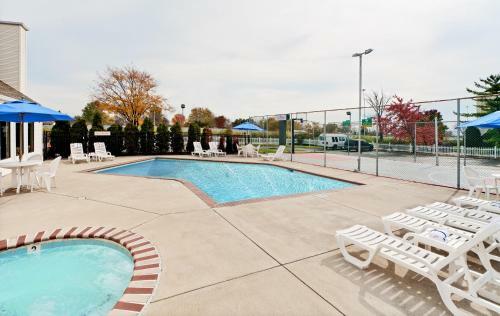 There's also a BBQ area and a convenience store, plus an outdoor pool and a fitness room. 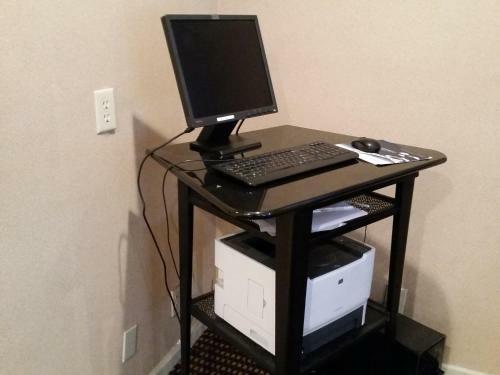 Other amenities include a business center and a coin-operated laundry. Pets are welcome for an additional fee.